Learn skills that change lives. Change the lives of students, their families and their communities with a Master's degree in TESOL, Literacy, and Culture. In this program, you'll develop a scholarly and practical approach to teaching English to those who speak other languages. You'll focus on culture, linguistics, second language acquisition methods and the methodology of teaching English. And you'll build an understanding of the complexities in working with culturally and linguistically diverse communities within the US and around the world. You'll emerge prepared to work in settings like community colleges, universities, adult education centers, language academies and international schools. You'll enrich your learning in classroom courses such as Cognition and Learning, Educational Reform and Cross-Cultural Communication. And you'll carry your classroom experience into the real world through over 150 hours of observation, teaching experiences, research practice and an international experience. Start your TESOL journey by exploring your scholarship and grant options. Starting summer 2019 a one year option is now available* for a Master's of Education in TESOL, Literacy, and Culture is available. During your program, you will spend 150+ hours in a TESOL classroom for observation, experience, and research. 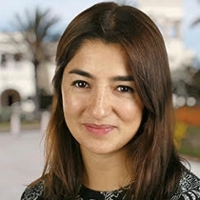 While working toward her Master's in TESOL, Paz gained critical hands-on experience by volunteering to teach English to immigrants in the Linda Vista community. Today Paz is currently working at Building Skills Partnership as an ESL and Citizenship Instructor. As the Academic Coordinator of the English Language Academy, a rigorous English language program at USD, Deborah Sundmacher is always looking for outstanding instructors. "Currently, three of our 12 instructors are graduates of the Masters Program in TESOL. The program's dual focus on theory and practical teaching skills has produced professionals with the passion and knowledge to make a real difference in the lives of our students." Learn about our student outcomes and get inspired by your own career potential. SOLES graduates with an MEd in TESOL find meaningful work in our own community and around the world, in places ranging from California community colleges to the International School of Panama to the University of Macau. You can explore your ability to make an impact as a teacher of English—while you explore the world.